Casablanca and Chefchaouen are two places that couldn’t be more different from each other, but that’s exactly why visiting both of these places during a trip to Morocco is such an attractive possibility for most tourists. As one of the more modern cities of Morocco, Casablanca will ease first time visitors, and greatly lessen any potential culture shock. Furthermore, Casablanca is a hub for traveling through Morocco. You will be hard pressed to find a bus or a train service that doesn’t go through Casablanca, or one that doesn’t have a route that ends or starts in Casablanca. However, getting from Casablanca to Chefchaouen is still a challenge! Chefchaouen is one of the most recommended tourist destinations of Morocco, and part of its allure comes from the fact that it’s literally secluded from the rest of Morocco, and it’s at least a couple of hours away from the nearest major city. However, many people feel hesitant about going from Casablanca to Chefchaouen during the same trip, as the two locations seem to be very far from one another. This article will detail the best route for going to Chefchaouen from Casablanca. There are only a couple of ways to go to Chefchaouen from Casablanca. One way is to take the CTM Bus. Tickets can be bought through their website at www.ctm.ma. The duration of this journey is six and a half hours, provided there are no delays. Furthermore, a bus for Chefchaouen leaves only once a day, so missing the 1:30 PM departure will result in having to wait another twenty-four hours before the next bus. However, there is a twenty-minute pit stop at a café for people to use the bathroom, stretch their legs, and catch a quick bite to eat. An alternative to the CTM bus would be to catch the Supratours bus from Casa Voyageurs in Casablanca. After 7 hours on the road, you’ll soon find yourself in the breathtakingly beautiful town of Chefchaouen, and the occasionally bumpy ride will have been worth it. There are some important points to note about the bus companies on this route. The road to Chefchaouen is windy and mountainous. The buses in Morocco are not to the same standard as in western countries, and you might find that the driver goes too quickly for your liking. It’s not uncommon to see overtaking on corners and other dangerous manoeuvers. Often, the air-conditioning is not turned on and instead the door is left open to aid circulation. Furthermore, seat belts may not always be available. However, despite this, the bus is the cheapest option and the best one for travellers on a budget. The bus is not recommended if you are travelling with children. The most convenient method of transportation is to take a taxi, either with a Morocco taxi company with licences for tourist transport, or a public grand taxi. By car the trip will take approximately five hours. The price will be different depending on which private company you choose, or which grand taxi driver you get. If you’re taking a grand taxi then the price will depend on how good your haggling skills are (check our grand taxi fare calculator to get an idea), but with a private company the prices are fixed. With TangierTaxi the fares start from 225 euros depending on the number of passengers. Considering the price of the bus, if you are travelling in a group, it might be more convenient to take a taxi if the difference is not so big. There are a few other ways to go to Chefchaouen from Casablanca, but these are the most convenient possible options. It’s important to note – once again – that these two places are far apart geographically, which makes traveling from one to the other extremely difficult even for locals. There is no train between Casablanca and Chefchaouen. Among the must-see destinations of Morocco are Marrakesh – with its colorful mosaics and golden sunsets – and Chefchaouen’s mountainous town, instantly recognizable by the contrast of its blue or whitewashed buildings and bright red roofs with only narrow streets separating them. However, most tourists typically visit only one of these destinations, and sometimes, the only thing holding them back is something as simple as the logistics of traveling from Marrakech to Chefchaouen or vice-versa. Marrakesh and Chefchaouen are known for different sights, and this is partly due to the sheer geographical distance between the two locations. 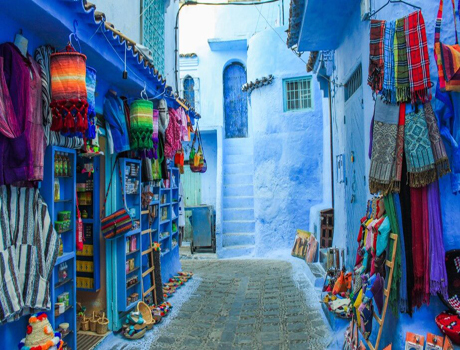 It takes an estimated 7 to 10 hours of travel to get from the city of Marrakesh to the small town of Chefchaouen. You may be wondering why the travel time seems to be so malleable, and the reason is that there are no direct flights or trains from Marrakesh to Chefchaouen. In fact, there aren’t any flights or trains to Chefchaouen. The very thing which makes Chefchaouen so unique is its seclusion and general mystery among tourism, but it is also what makes it difficult to visit. This shouldn’t dissuade you, as there are many ways to visit both Marrakesh and Chefchaouen for a determined tourist. This article will show some of the ways you can do this. We will list the various routes by longest to shortest duration of travel, and we will be including the estimated price in order to help you with your decision making. This option is the fastest and most comfortable, but also the most expensive. If you are travelling alone, it is definitely a premium option. But if you are travelling in a group of 3 or more, it could be worth considering. It depends on your budget, but a direct door-to-door service will take away a lot of the stress and you should arrive in Chefchaouen refreshed and ready to explore. Check out more information about private taxi companies in Morocco. We recommend TangierTaxi, who also provide free bottled water to customers and WiFi in most of their cars. This is one option for those on a budget. Unless you buy all the seats, it will be impossible to find a grand taxi driver who will be prepared to take you all the way to Chefchaouen, so you will have to take several taxis on the way. You will have to switch in Casablanca and Rabat. For those unfamiliar with grand taxis, they are generally old vehicles which carry 7 passengers plus a driver. Grand taxis are cramped and uncomfortable when full, because these vehicles are not really designed for 8 people in total. Bear this in mind, because the journey from Marrakech to Chefchaouen is a very long one, especially if you are uncomfortable. Since you will have to wait for the other seats to fill up, you should take this option if you are not in a rush, because you could wait for a few hours until the driver is ready to go. The small difference in price between taking a grand taxi and a private transfer from Marrakech to Chefchaouen makes the grand taxi quite an unattractive option for this route. Those on a budget should consider the train / bus options below. Read more about taking grand taxis in Morocco. Although this route takes the most time, it is perhaps the simplest to follow with the widest margin for error. From Marrakesh, you can catch a train to Casa-Voyageurs (in Casablanca). As it is operated by the Moroccan Railways (ONCF), a train for Casa-Voyageurs leaves every hour, and a ticket can cost anywhere between ten to twenty dollars. Trains are often running late – be careful that you do not get caught out. Upon arrival, you should catch the train to Souk El Arbaa. A train for Souk El Arbaa leaves every four hours, which is why we advise you to arrive with plenty of time in order to allow for any possible delays en route. This trip from Casablanca to Souk El Arbaa will take three hours, and it will cost nine to eighteen dollars. Sadly, this also marks the end of your journey by train, and from here, you’ll be taking a bus. The bus station is over a kilometer away from the train station, so you can choose to either walk or utilize public transportation to go between stations. The bus to Chefchaouen costs six to eight dollars, and it leaves only once per day, so you should leave allowances in your travel schedule to account for this, or set aside some accommodations for an overnight stay. The bus takes two hours, but you’ll find that it’s all worth it once it arrives in Chefchaouen. If you plan everything properly, you could leave Marrakesh early morning, and arrive in Chefchaouen in time for dinner. Unlike the previous option, this includes only one transfer, and your travel will be limited to a bus during the entirety of the trip. You should be able to get from Marrakesh to Fes within eight hours. The bus for Fes leaves every four hours, so you can work your timetable around that with ease. However, upon arrival in Fes, you need to make sure you arrive in time for the bus to Chefchaouen. This bus leaves only four times a day, and although delays and traffic aren’t very common, it’d be safer if you planned your arrival for a full two hours before the departure for Chefchaouen. That way, you’ll have time to catch some food to eat, in addition to some sightseeing of the nearby area. The bus ticket will cost about $7-11, and after a brisk four hours, you’ll arrive at your destination with only a total of twelve hours of traveling under your belt. If you aren’t a fan of being earthbound for an extended amount of time while traveling, then have no worries. You can book a flight from Menara Airport (RAK) in Marrakesh, and relax on the hour-long flight to Fes. A domestic plane ticket will cost anywhere between a hundred to three hundred dollars, which makes this route one of the more expensive suggestions on this list. Upon arrival, you can catch a cab to the bus terminal, which shouldn’t take longer than twenty minutes, and arrive in time to catch a bus heading for Chefchaouen. While this is the most expensive route on this list, it may be the perfect way for any newcomer to Morocco to see as much of the country as possible within a limited time span. Catch a three-hour flight to Tangier (TNG) from Menara Airport (RAK) in Marrakesh. This can cost as low as $165, or as high as $370 – it really depends on your luck and timing. Once you arrive, you can take a cab to drive you all the way to Tetouan. This should take forty minutes or an hour at most, and you’ll be able to see more of Morocco during this drive. From Tetouan, you can buy a five-dollar bus ticket to Chefchaouen, and you’ll arrive within an hour. You should know that the Tetouan bus bound for Chefchaouen leaves only once a day, so you should plan your trip around this. Also check out our advice for travelling from Tangier to Chefchaouen. These are just some of the numerous ways of getting from Marrakesh to Chefchaouen, but I hope that reading this list has eliminated the idea that you can’t visit both tourist destinations in one trip from your mind. It may take a full day of travel and some careful planning, but you’ll find that it’ll be all worth it, as you’ll be privy to sights that even some Moroccans haven’t seen. Taxis in Morocco are the most popular forms of transport. Even though there is a rail and bus service between major cities, the network is not so expansive and punctuality is still an issue. Flying is also an option, but tickets are extremely expensive by European standards. So taking taxis is the most common way of getting around, for both short trips in the city to long-distance journeys across the country. Taking a taxi in Morocco is not as simple as in other countries, and there are a few things to be aware of before you take one. This article is going to focus on the different types of taxis in Morocco, along with the advantages / disadvantages / costs of each one. The first type of taxi on our list is the Petit Taxi. Coming from the French word petit, meaning small, a petit taxi is only for short distances and carry 3 passengers; 1 in the front and 2 in the back. A petit taxi cannot leave the city limits, so cannot be used for inter-city transfers. They are just for short trips around the city centre and suburbs. They are abundant in most Moroccan cities, and can be found without much difficulty. There are taxi ranks dedicated to petits taxis in strategic positions across the city. These ranks are often combined with a grand taxi stop, which is a different type of taxi. Petits taxis are very cheap. The cost of taking a petit taxi is much lower than the equivalent of taking a taxi in Europe or the US, but bear in mind that the condition of the vehicle may not be up to the same standards. Taking a petit taxi at night time is more expensive than during the day, but only by a little bit. As in European countries and the US, it is customary to leave a small tip to the driver. Petits taxis often do not have meters, so it will be necessary to negotiate a fixed price in advance with the driver. As a tourist, this could leave you open to exploitation, so don’t forget to read our article about taxi haggling in Morocco. Some petits taxis in big cities do have meters as a measure to prevent tourists from being ripped off, but some drivers might not want to turn it on. If this is the case, you should get out and find another taxi. Most Moroccans share their taxi with other people heading in the same direction, so your taxi might not leave until all of the seats are taken, and may stop on the way to pick up others. You can hire the whole taxi for an agreed price, but be prepared to pay over the odds, although if you are in a rush then you don’t really have any other choice. It is a fact that petits taxis are not well-known for their comfort, so don’t expect leather seats and air-conditioning. 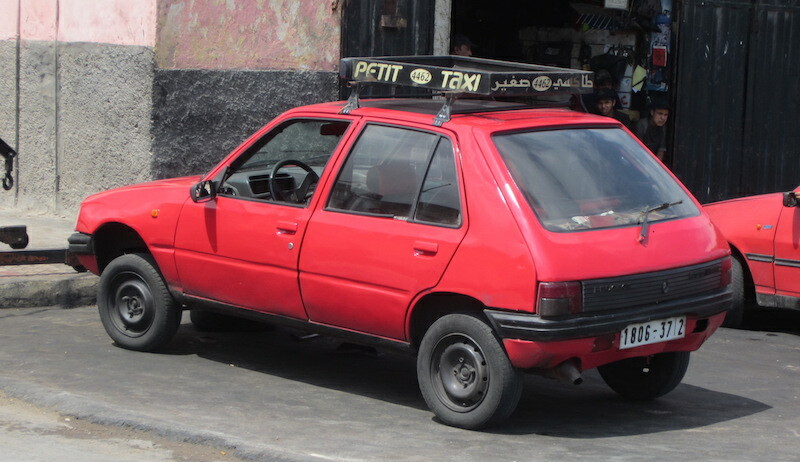 The average petit taxi is a small, 4 seat vehicle such as a Fiat Uno produced in the 1990s. While they are not comfortable, they are perfectly fine for short journeys around the city. These taxis seldom have seatbelts either, so if you are travelling with young children for example, you may prefer to book a better vehicle through a private company. The roads and driving habits in Morocco are not great, and in the city it can be quite chaotic at times, so taking a petit taxi could be stressful if you have children. However, it does seem to be an organised chaos, and the drivers are more than used to it. Despite the size of a petit taxi, it is probably too big to drive down most streets in the medina, so if your destination is in the medina of a city in Morocco, bear in mind that you will probably have to walk the last leg. Getting from city to city in Morocco can be a long and expensive affair. The flights are expensive and infrequent, the trains are slow and often late, and the buses are not always up to expected safety standards. 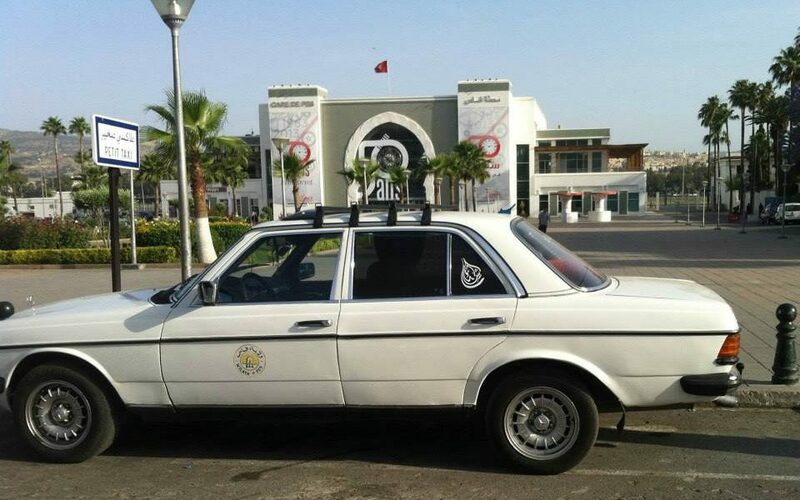 The result is that for many Moroccans, getting from A-B involves taking a grand taxi. Grand taxis are normally old, beige Mercedes and are capable of carrying up to 6 passengers at a time. They carry 4 passengers in the back, and 2 in the front (next to the driver). Yes, really. 7 people crammed into that small space! They don’t have air-conditioning either, so on a hot summer’s day you must really remember to take plenty of water. But it’s the most common way of getting around for normal Moroccans, so it is a good opportunity for a true Moroccan experience. Grand taxis can be easily found in major cities. As with petit taxis, there are often conveniently-located ranks around the city where you can found an abundance of grand taxis waiting to take you wherever you need to go. Grand taxis are permitted to travel outside of the city limits, whereas petit taxis are not, so if you’re looking to travel for longer distances, make sure you get in a grand taxi. When taking a grand taxi in Morocco, Moroccans almost always share with others. It is quite expensive for a local to rent out the entire vehicle, so the cost is often shared between others. In fact, you only end up paying for your seat. So, if you want to travel privately with no other passengers, you will have to buy the 6 other seats. You can find out more about the costs of taking a grand taxi by using our grand taxi fare calculator. Driving conditions in Morocco do not match those in Europe or the US. Standards are much lower, and the sad truth is that many people die on the roads in Morocco each year. Grand taxis do not have seat belts, and the drivers are often poorly-trained, so you must be assertive if you think your driver is going too fast. He is very unlikely to speak English, so you’ll have to tell him in Arabic (or possibly French). Moroccans have a tendency to overtake cars on corners, or on hills, so you might be in for an experience if it is your first time on the roads in Africa. This is a warning, but should not act as a deterrent, since the reality is that you are unlikely to be involved in any accidents if you remain sensible and communicate with your driver if he is going too fast. If you are travelling with children, then maybe you should look into private transport in Morocco. Do not expect your driver to know where your address is, even if you have it in Arabic. Roads are seldom signposted in Morocco. If your destination is in a medina, then you will have to walk the last leg, because taking a grand taxi into the narrow streets is forbidden and often impossible. Finally, some grand taxis only drive on certain routes. If it is late at night, or a holiday, you might have to stop en route to change taxi. You may also be forced to share your vehicle with other people if availability is limited, since it is a bit unfair for one or two people to take up an entire car when locals do not have another option. Knowing what to pay in Morocco can be difficult, and it’s sometimes hard to shake the feeling that you’re being ripped-off because you’re a foreigner. It’s true that while salaries in Morocco are high compared to some African countries, the average wage is significantly lower than that in Western Europe. The result is that some unscrupulous individuals will try to take advantage of you and overcharge you for products and services. It is important to remember, however, that this is the exception to the rule, and most Moroccans are not looking to rip you off. In European cities like Barcelona, Paris, and Rome, taking taxis is never particularly fun but always expensive. As a tourist in a new city, you have to place a lot of trust in your taxi driver because you are in unfamiliar surroundings and perhaps do not know the local culture or customs. Unfortunately, it is well-documented that some taxi drivers in these cities take the long way round in order to artificially inflate the fare, or refuse to use the meter and charge more than it should be. In Morocco, the same problems exist, and so it’s necessary to take the same precautions as you would in tourist hotspots like Barcelona, Paris and Rome. However, the good news is that it’s significantly cheaper in Morocco to travel by taxi, and if the driver is trying to get some extra cash out of you by going the long way round, it is likely to be a very insignificant amount for you. But of course, out of principle you shouldn’t pay more for your taxi than anybody else just because of the colour of your skin or the language you speak, so there are a few things you should do in order minimise the risk of getting ripped off by petit and grand taxi drivers in Morocco. Use our Grand Taxi Fare Calculator to work out how much your trip should cost. This calculator is a general guide, and should only be used as an indicator, although it will at least give you an idea of how much you should pay for a given journey. Learn some Arabic expressions. 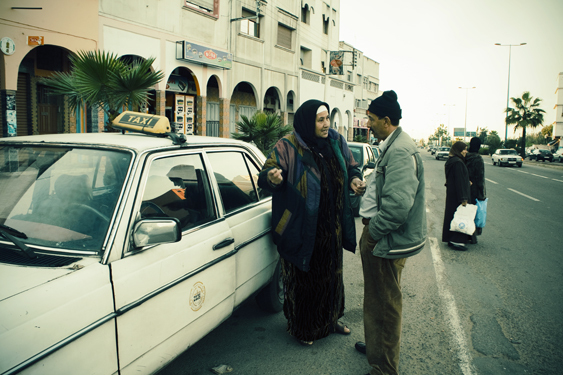 Taxi drivers in Morocco are unlikely to speak any English, and French is not always as widely-spoken as some people believe. In the North in particular, French culture and speaking French can be a controversial subject, so being able to speak a few words of Arabic will get you much further in your Moroccan taxi negotiation and will probably be appreciated by the driver. Grand taxis do not have meters, but most petit taxis do. So, if you’re taking a petit taxi in a Moroccan city, you should ensure that they have their meters on. Not all petit taxis have meters, so if yours doesn’t then you should avoid taking it unless you have an idea of the right price and can agree on it beforehand with the driver. Try to avoid putting yourself into a position where you are a captive audience for the taxi driver. For example, airports and border crossings are generally bad places to take taxis because you have limited options, and this puts you at a disadvantage from a negotiation standpoint. If you know that you are going to be in a position like this, you should book online in advance through a reputable taxi company in Morocco so that there are no surprises. Be confident, and don’t act like a clueless tourist. Speaking a few words of Arabic is the best way to do this. You want to give the impression that you know where you are going, and that you know what the price should be. This will reduce the chance of the driver trying to rip you off. If you follow this advice, you will be much more likely to achieve a fair price. You will still probably pay slightly more than the locals, but at least you won’t be taken for a ride and milked for every penny. Although taking taxis in Morocco is cheaper than in most of Europe, remember that the costs are not necessarily that much lower, and that petrol/diesel and insurance are only marginally cheaper than in more expensive countries.